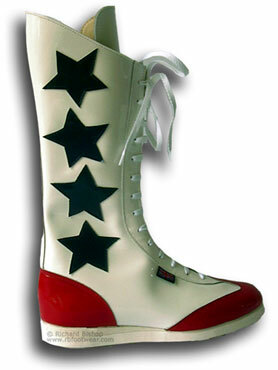 Example image above shows high leg lined White patent wrestler boot with red suede trim and blue leather stars. Custom ringside promotion wrestlers begin life as one of our popular classic range either patent or natural hyde leather and fully lined. Size range 5-12 although we can manufacture up to size 16 please ring or email for a quote. Basic cost is £170 For additional work email before buying .